Proper notice is key to a successful lien claim. A Notice of Furnishing is a type of preliminary notice that must be provided to a property owner by a subcontractor, contractor, laborer, or supplier as a condition to obtaining a later mechanic's lien covering the full amount of labor or supplies. This Notice must be sent by any party who has not contracted directly with the owner to preserve that party's lien right. 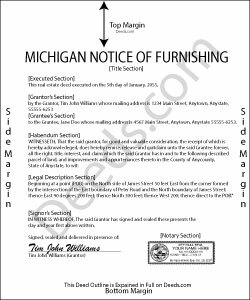 In Michigan, a subcontractor or supplier who contracts to provide an improvement to real property must provide a Notice of Furnishing to the designee and the general contractor, if there is one (as named in the Notice of Commencement) at the address shown in the Notice of Commencement, either personally or by certified mail, within 20 days after furnishing the first labor or material. M.C.L. 570.1109(1). The Notice of Furnishing must contain the following information by law: (1) the name of the owner (or designee or lessee) as noted in the Notice of Commencement; (2) the name and address of the claimant furnishing materials or services; (3) description of services or materials furnished; (4) the book number and page number in the county recording index (and name of county where recorded); and (5) proof of service on the property owner. M.C.L. 570.1109(4). If the lien claimant fails to provide a Notice of Furnishing within the time specified, this will not defeat the lien claimant's right to a later construction lien for work performed or materials furnished by the lien claimant before he or she served the notice of furnishing. M.C.L. 570.1109(6). However, the lien will only be applied to the extent that payments were made by or on behalf of the owner or lessee to the contractor pursuant to either a contractor's sworn statement or a waiver of lien in accordance with this act for work performed or material delivered by the lien claimant. Id. While subs and suppliers have 20 days to serve the Notice, laborers must serve it within 30 days of a wage claim arising. If a laborer neglects to serve the Notice of Furnishing on an owner's designee, though, the laborer loses the opportunity to file a lien claim for wages. M.C.L. 570.1109(8). If the laborer fails to provide a notice of furnishing to the general contractor within the required time, this will not defeat the laborer's right to a construction lien, but the laborer shall be liable for any actual damages sustained by the general contractor because of the failure. M.C.L. 570.1109(10). This article is provided for informational purposes only and should not be considered legal advice or used as a substitute for speaking with an attorney. Please consult with a Michigan-licensed attorney for any questions about serving a Notice of Furnishing or any other issues related to liens.